Three outstanding graduating seniors were announced as this year’s Boisfeuillet Jones Medal winners during Class Day. Students are selected based on how they exemplify distinguished alumnus Jones' commitment to citizenship, leadership, academic excellence, service to Emory and the larger community, and "potential to become a 'Change Agent' in their chosen profession and society at large," according to the award criteria. The awards, established and endowed by the D.V.S. Senior Society, are given annually to one senior each from Emory College of Arts and Sciences, Goizueta Business School and Nell Hodgson Woodruff School of Nursing. Brian Delgado, Emory College of Arts and Sciences: A double major in international studies and Latin American and Caribbean studies, Delgado has been active both on campus and off. At Emory, he was selected as a fellow for the Center for the Study of Law, Politics and Economics and also served in three offices of the Latino Student Organization. Already fluent in Spanish and English, Delgado became proficient enough in Portuguese to serve as an intern for the BRICS Policy Center in Rio de Janeiro and act as a translator for the United Nations. Sumaali Pradeep Chheda, Goizueta Business School: A double major in business and computer science, Chheda was instrumental in both the Goizueta Finance Group and Goizueta Investment Management Group, growing both organizations and helping them teach financial literacy skills to at-risk community youth. Her proposal for a joint actuarial science concentration between Emory College and Goizueta is currently under review by administrators. If approved, it will be the first program conceived and designed by a student. Chuncey Ward, Woodruff School of Nursing: Ward, who previously earned a bachelor’s degree in mass communication/electronic media from Albany State University, was selected for his work on various projects and volunteer efforts. As president of Emory’s Student Nurses Association, he led panels both for fellow students and with various community groups around Atlanta. All three also were named among the 100 Senior Honorary, presented by the Emory Alumni Association and the Student Alumni Association. 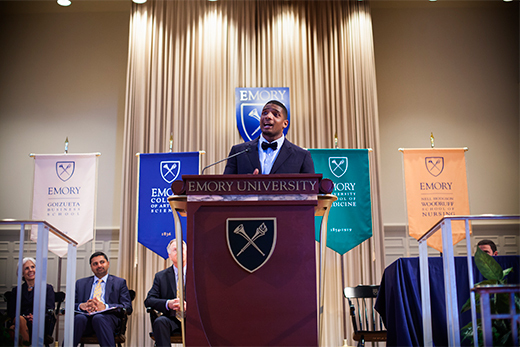 Embrace adversity if you want to thrive, Michael Sam told Emory’s undergraduate Class of 2016 on Thursday night. It was not a platitude. At just 26, the man who became the first openly gay player drafted in the NFL simply shared his story. A sister died before he was born. Of seven siblings, one brother was killed and another disappeared and hasn’t been seen since 1998. Two other brothers are in prison. Sam insisted he would do better, despite naysayers in his small Texas hometown. He studied in high school while his friends partied. He played Division I football at the University of Missouri after being told he was too small. And in December 2013, he graduated from college as these students will do on Monday, earning his sports management degree while carrying the title of SEC Defensive Player of the Year. Before this week, Sam was last in Georgia during the 2013 SEC Championship game between Mizzou and Auburn (don’t ask him who won). His speech at Class Day was his first address of this kind, and he was the youngest speaker in the pre-Commencement event’s 14 years. Students selected him for his ability to resonate with graduating students and relevance to the Emory community, said Max Mayblum, Class Day chair, who will graduate with a business degree on Monday. Sam: "Do not be afraid to fail"
Addressing the audience without notes, Sam spoke casually and to plenty of laughter, trying to convey that message of inspiration. Struggling in childhood helped him prepare for the unexpected hurdles that popped up after he came out. He expected the news to fade after a week or so and was surprised to see it stay a topic of conversation as the NFL draft neared. And when the then-St. Louis Rams announced his name in the 2014 draft and he kissed his then-fiancé in celebration, he was shocked again. The Rams cut Sam before the regular season, and a stint with the Dallas Cowboys only lasted six weeks. He sat out the 2014 season and played one game in the Canadian Football League last year before deciding to try again with the NFL this year. He promised students he wouldn’t quit trying this year, though he did say he will “move on” from the NFL if he doesn’t make it this season. Other plans are in the works, including potential TV work and setting up a scholarship fund for LGBT athletes. Students should likewise not quit on what they believe in, because life will undoubtedly throw things in their way, he advised. The crowd responded with a standing ovation after Sam’s remarks. They gave him high marks for going off script and making himself vulnerable to make his points. “He was interesting because he shows you adversity is really an opportunity to be strong,” said Molly Talman, a neuroscience and behavioral biology major from Chicago.